93″ x 3/4″ wide blades fit most 7″ x 12″ horizontal metal cutting band saws such as Delta, Jet and others. 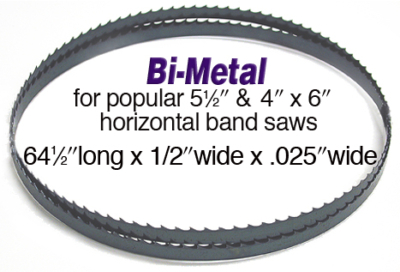 64-1/2″ long x 1/2″ wide blades fit most 4″x 6″ horizontal/vertical metal cutting band saws. 44-7/8in. x 1/2in. 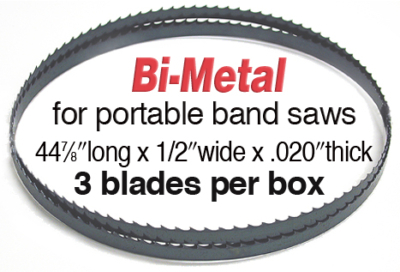 wide blades for portable band saws such as Milwaukee, Makita, Black & Decker, Porter Cable or others. Hard Edge Hard Back permits greater tension, improved blade rigidity, straighter, more accurate cuts, and greater blade strength allowing higher feed pressure. Ideal for easy-to-machine metal and similar materials at slow speeds and interrupted cuts such as pipe, tube, channel stock, etc. These 1/2″ wide blades offer economy & value for mild contour cuts on vertical machines and cutoff operations on common horizontal band saws. Bi-Metal Matrix with Variable Pitch Teeth blades have a high speed matrix cutting edge, electron beam welded to a low alloy shock resistant back and resist heat in excess of 1000 degrees F. They cut faster, last 10 times longer than carbon flex back or hard back, and have excellent shock and abrasion resistance. 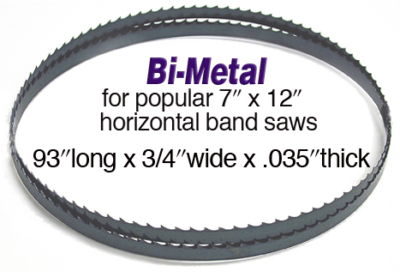 Use Bi-Metal Matrix blades for horizontal gravity fed metal cutting band saws to cut a wide range of hard materials in production cut-off operations using heavy duty horizontal band saws. Narrow widths are for vertical band saws to cut radii in hard-to-machine die steels, for contour cutting, re-sawing exotic woods, and for solids and for interrupted cutting. 64-1/2in. long x 1/2in. wide x .025in. thick for popular 5-1/2in. and 4in. x 6in. horizontal band saws. Variable Pitch Teeth vary in size, set and gullet depth which brings teeth into the work at constantly changing angles for fast, smooth and quiet cutting. The varying gullet sizes allow increased protection against tooth strippage when cutting on a wide range of materials and/or dimensions. 93in. long x 3/4in. wide x .032in. thick. Hard Back for 7in. x 12in. horizontal band saws. Fits Jet® JHVG-7120, Jet® JHVBS-7MW, Clarke 7in. x 12in., Birmingham RF-712N or RF-712DR, Dake-Johnson SE712, Enco 7in. x 12in. and 7in. x 12in. Deluxe, Ganesh S712, Grizzly G0561, Northern Industrial 8in. 145760, Rong Fu CPTRF-712N, Star HVBS-712, WMH3400 Dry or WMH 3410 Wet and all 14in. Vertical Metal Cutting Band Saws taking 93in. or 93-1/2in. long (3/4in. wide) band saw blades. Wavy Tooth Style has three teeth with varying sets to the right followed by one straight tooth and three teeth with varying sets to the left. Because three teeth share the cutting and the set extends below the gullets, wavy set teeth are less likely to strip than raker set teeth. 93in. long x 3/4in. wide x .035in. thick. Bi-Metal for 7in. x 12in. horizontal band saws. Fits Jet® JHVG-7120, Jet® JHVBS-7MW, Clarke 7in. x 12in., Birmingham RF-712N or RF-712DR, Dake-Johnson SE712, Enco 7in. x 12in. and 7in. x 12in. Deluxe, Ganesh S712, Grizzly G0561, Northern Industrial 8in. 145760, Rong Fu CPTRF-712N, Star HVBS-712, WMH3400 Dry or WMH 3410 Wet and all 14in. Vertical Metal Cutting Band Saws taking 93in. or 93-1/2in. long (3/4in. wide) band saw blades. Variable Pitch Teeth vary in size, set and gullet depth which brings teeth into the work at constantly changing angles for fast, smooth and quiet cutting. The varying gullet sizes allow increased protection against tooth strippage when cutting on a wide range of materials and/or dimensions. 1 per box Bi-Metal 44-7/8in. long x 1/2in. wide x .020in. thick. Fits all popular portable band saws such as Milwaukee, Makita, Black & Decker, Porter Cable that use 44-7/8in. long x 1/2in. wide blades. 3 per box Bi-Metal 44-7/8in. long x 1/2in. wide x .020in. thick. 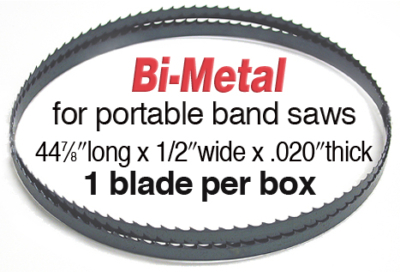 Fits all popular portable band saws such as Milwaukee, Makita, Black & Decker, Porter Cable that use 44-7/8in. long x 1/2in. wide blades.